Will Snow Slow February Home Sales? Children love snow days because they mean hours of sledding instead of school. But heavy snowfall can also cause home sales to slow. If we get the heavy snow that some have predicted for February, we could see a temporary drop in sales. Today, heavy snow is falling in New England. Folks up there might be under two feet of snow by tomorrow. The real estate market in the DC Metro, Baltimore Metro, Northern Virginia and Greater DC area continued to strengthen in 2012. We decided to take a closer look at the year-over-year trends for a variety of metrics and identify some Top Fives per region. Most Expensive, Most Affordable, Biggest Price Increase, Biggest Increase in Sales, Shortest DOM, Longest DOM, and which ZIP codes had the lowest or highest sales to list price ratio per region. Of all ZIP codes analyzed, 22206 in Great Falls had the highest median sale price at $961,250. Baltimore's 21223 had the lowest median price at $18,000. 22205 in Arlington had the lowest Median DOM, where half the homes sold were on the market 10 days or less! Just a quick post to congratulate RBI customer Dominic Morrocco, co-founder of M Squared Real Estate, on making the Annual Inman 100 Roundup! As a co-founder and partner in M Squared Real Estate, Morrocco oversees the company's technology and marketing divisions.The M Squared website is among the most informative and user friendly broker sites we've come across and we absolutely love the innovative ways in which Dominic and team integrate RBI stats and reports throughout the site! M Squared has obviously invested serious time and talent into their website. 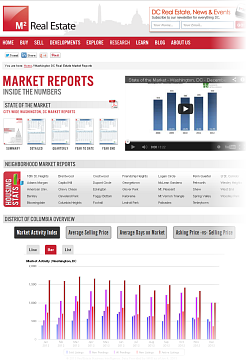 Visitors have access to Detailed and Local Market Insight reports as well as interactive charts for every ZIP code within the District of Columbia. This content, coupled with intuitive real estate search tools and more, makes msquared.com a standout in the local real estate space! As the year concludes, most indicators point to a healthier market than last year, but several clues reveal a possible softening of demand in the near-term. Sales numbers and the median price are up from this time last year, but new contracts have declined slightly for the 2nd straight month. Additionally, unseasonable declines in sales and median price from November could be an early sign of weakening demand. The market is experiencing historically low inventory, with active listings at their lowest December-level in nearly a decade, and new listings at their lowest level for any month on record. While intuitively low supply would put upward pressure on prices, it could be that many buyers are deciding to delay their home purchase until more options become available on the market, which is loosening the pressure on pricing as evidenced by the $11,000 drop in the median sale price from November. Many potential sellers could be hesitant to enter the market during the winter months, so an increase in the spring inventory would likely entice buyers back into the market, and push median prices back up. The Baltimore Metro housing market has experienced considerable improvement this past year. Most indicators point to a healthier market going into 2013, and the trend continues in December with year-over-year growth in sales, new pending contracts, and the median sale price. 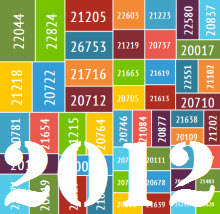 The most striking aspect of the 2012 market has been the diminishing supply of homes for sale. Active listings continue to plunge, and have fallen below 10,000 for the first time since February 2006. This pattern appears to be slowly changing, as new contracts have been hovering around the 2011 level for the past 5 months. The condo market continues to see the most growth activity, and leads in year-over-year gains in sales, new contracts, and median sale price. As we continue through the winter season, it is unlikely that a dramatic surge of new listings will enter the market. This should keep upward pressure on prices as long as buyers remain active. If the inventory becomes too low, many buyers might decide to wait it out until more options become available, which could bring prices down in the near term.